I’ve been upgrading the MapTubeD tile renderer code to use the latest release of SharpMap and came across the problem of SharpMap not being a signed assembly. This is a real problem as MapTubeD is signed and so can’t reference an unsigned assembly. The rest of this post details how I built SharpMap from scratch and use the NuGet tools to sign all the referenced assemblies manually. Before you start, make sure you have Powershell version 3.0 installed. I found that the previous version had an issue when doing a recursive dir command with a wildcard i.e. “dir -rec *.dll” didn’t work. First, download the latest code release of SharpMap from here [link] by clicking on the “download” link. The changeset I’ve been using is 105237, but I found the download to be very slow, even on a very fast Internet connection. It is very important to right click on the zip file before you unpack it, select “Properties” from the menu and click the “Unblock” button on the “General” tab. This prevents the warning from Visual Studio of using an application from an untrusted source. Now extract the zip file to a suitable location. Open the SharpMap solution (Trunk\SharpMap*.sln) in Visual Studio so you have it open, but don’t compile anything yet. Ignore the Team Studio messages as you don’t need to log in. I also got an error regarding the SharpMap.Demo.WMS example project not being a supported project type, but I ignored this and continued. Find the main SharpMap project in the “Solution Explorer” (it should be in bold), right click on it and select “Properties”. Click the “Signing” tab on the left, tick the “Sign the Assembly” box and click on the “Choose a strong name key file” drop down. Select “new” and enter “SharpMap.snk” in the “Key file name” box, but UNCHECK the “Protect my key file with a password” check box. Click save and close the dialogue. Now do the same for the “GepAPI.Extensions” package above the main SharpMap one which you just signed. This time I used “GeoAPIExtensions” for the key file name, but everything else is the same. Now do a “Build” and “Rebuild Solution” to build everything. If you get an error saying “check ‘Allow NuGet to download missing packages during the build’ “, then follow the instructions to change the NuGet download settings. I found mine was already set to download, but ended up clicking the “Update” button from the “Tools”, “NuGet Package Manager”, “Manage NuGet Packages for Solution…” window. This wasn’t necessary on the first computer I tried this on. At this point you will see build errors relating to Strong Names i.e. 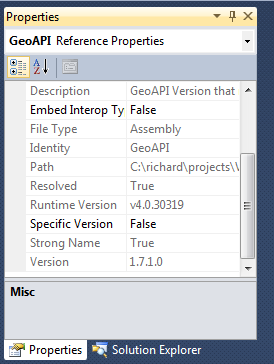 Assembly generation failed — Referenced assembly ‘GeoAPI’ does not have a strong name. You can check this by right clicking the “GeoAPI.dll” in the “References” folder of the solution, selecting properties and seeing “Strong Name” and “false” in the properties window. Now is the part where all the 3rd party assemblies need to be signed. This is the tool used to sign the package references that are included by SharpMap, namely BruTile, ProjNet, NetTopologySuite and GeoAPI. You might get prompts asking about signing of sub assemblies, so just answer “Y”. Now, when you look at the properties for the GeoAPI DLL under the “SharpMap\Resources” folder in the Solution Explorer, you should see that the “Strong Name” property has changed to “True” (see image above). Check the packages are signed by right clicking on the DLL under the “References” tab of the project and selecting “Properties”. The “StrongName” property should now show as “True” for all the packages above. Rebuild all and SharpMap will now be a signed assembly with a strong name. As anybody who was trying to fly last Friday will know, a software failure at NATS caused the closure of UK airspace for 36 minutes between 15:27 and 16:03. The delays at Heathrow continued until Saturday as the system runs at 99% capacity and so has no spare capacity to recover from a failure. 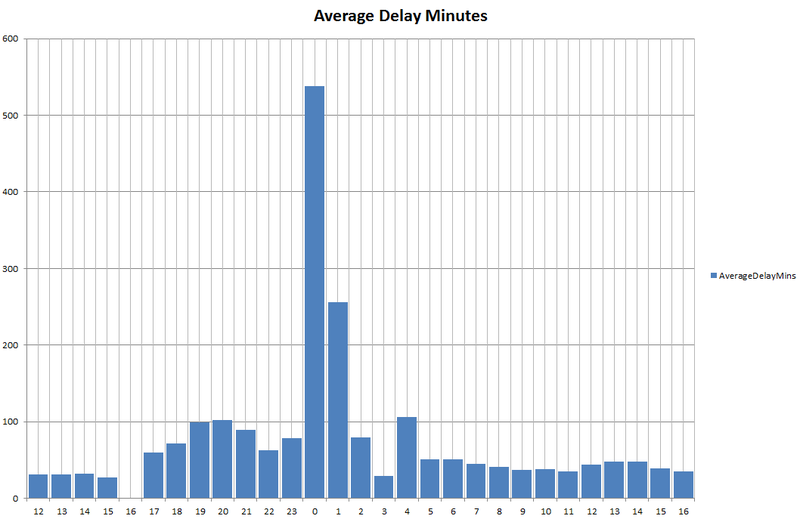 Average delay minutes at Heathrow. The x-axis shows the hour of the day from 12:00 on 12th December 2014 until 16:00 on 13th December 2014. 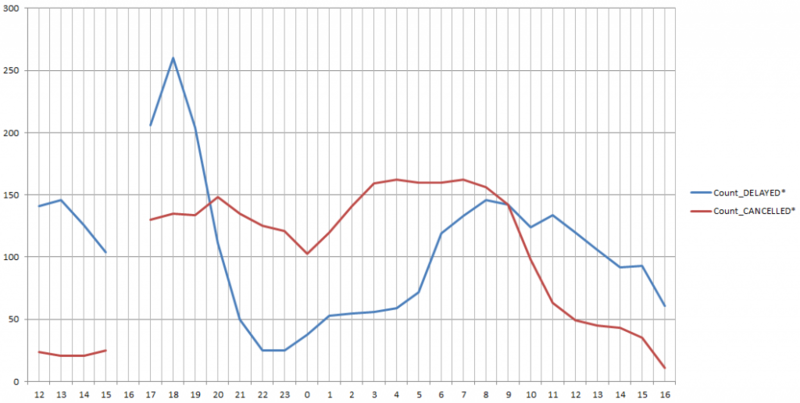 Both graphs show the same data, with the x-axis divided into hours. The fault with the air traffic computer system occurred at 15:27, but unfortunately, the 16:00 data is missing. This might be attributable to high demand on the web server giving information to passengers. The other interesting feature is that the first peak occurs round about 20:00 on the 12th, then it looks like things are getting back to normal until midnight on the 13th, when there is a sudden peak of over 500 minutes. Looking at the data, this is accounted for by a large number of transatlantic flights (about 110) all arriving several hours late at around the same time. This might be a sensible option, as by delaying flights arriving from long distance, they can get the flights that didn’t leave earlier in the day out, then extend the airport operating hours to clear the backlog. My main reason for showing this data is that I’ve attempted to analyse it before and failed. That time it was snow that caused the airport [link], but the type and complexity of the data is currently preventing analysis. The graphs above don’t show the number of planes being handled, or the number being cancelled. The data is also very dirty in the sense that it’s very difficult to analyse with a computer something that is a plain text description designed for a human. The status text can be something like “LANDED”, “EXPECTED”, “CANCELLED”, “CALL AIRLINE”, “TAXIED”, “AIRBORNE”, or “SCHEDULED”. 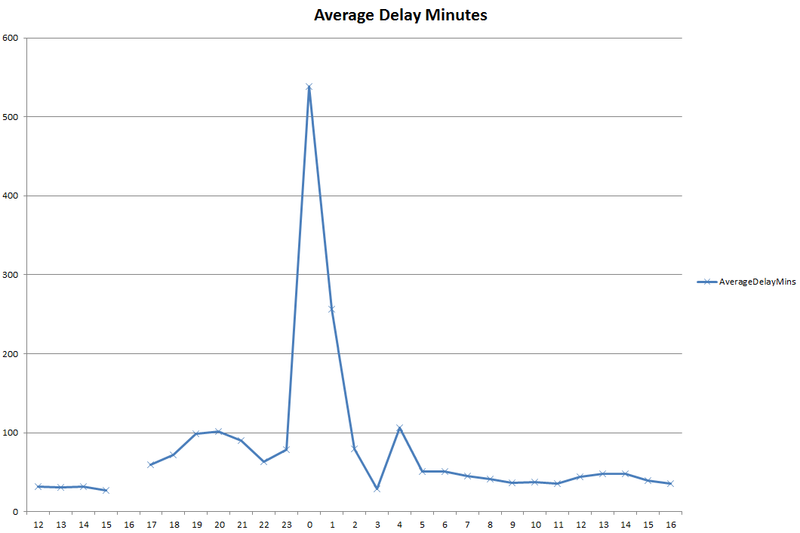 Also, the delay minutes can be negative if a plane gets in early, so, in the data above, this pulls the average down. I don’t think this is significant, though, as far too many aircraft have delays of hours for a few minutes early to make much difference. This does highlight the other problem, which we also see with the rail data, where a delay of 10 minutes on a route that takes 40 minutes is more significant than 10 minutes’ delay on a train from Scotland to London. Similarly, with the airports data, transatlantic flights taking over 24 hours are hard to analyse side by side with European flights taking 1 or 2 hours. Basically, I’m still struggling with how to handle this data and how to include it with all the other factors we have which show how well London is operating. I think that more work needs to be done on data mining the archive data to establish a reliable baseline and detection of significant features. Then the data fusion to bring the airports data in with all the other transport data can happen. It would be interesting to know whether the Victoria line problems were a knock-on effect of the Heathrow problem on Friday night. Absolute number of delayed and cancelled flights at Heathrow. The x-axis shows the hour of the day from 12:00 on 12th December 2014 until 16:00 on 13th December 2014.